A student in Milton Keynes, England paid a full bus fare for Marcus Fenix. No, really. 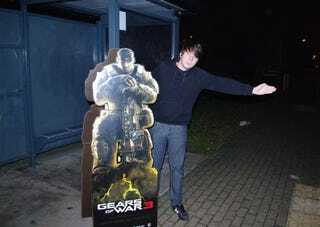 Carrying home a life-size cardboard display of the Gears of War protagonist, Liam Sheridan was told by the driver his monthly bus pass didn't cover his companion. Sheridan, 17, was thus charged £1.80 for a full adult fare on top of his monthly pass, after the bus driver insisted that his cardboard Marcus "takes up a seat, so it's full price." "It was truly bizarre, I couldn't quite believe it," Liam told the Milton Keynes Citizen. "I tried to protest but the driver wasn't going to let me on otherwise, so I had to pay him." The Citizen followed up with the transit authority, which said it wasn't commenting until its investigation was finished.